Though this side of town (away from the Foss) stayed mainly dry in the recent floods, there were sudden surprising amounts of water in a few places. On Boxing Day, photos on Twitter alerted me to the fact that Water Lane in Clifton was in one section true to its name, and covered in water. I went up there to have a look. 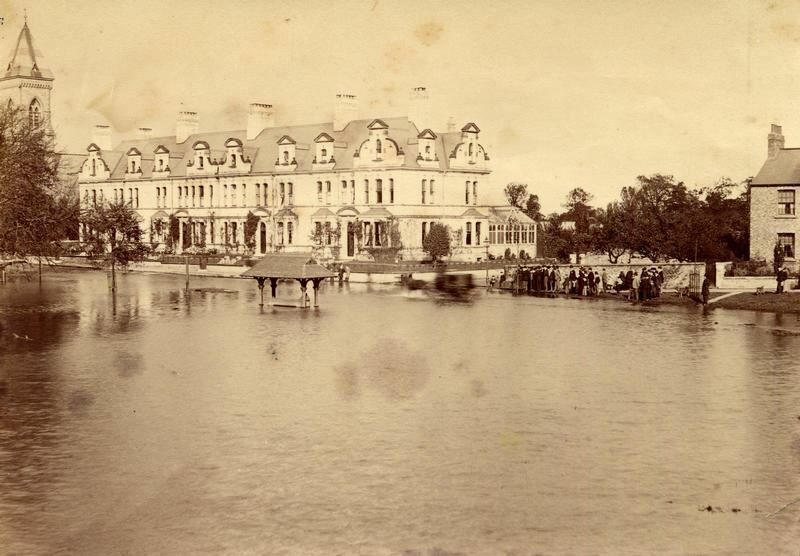 A large lake had appeared at the lower point of the road, at the junction with Kingsway. 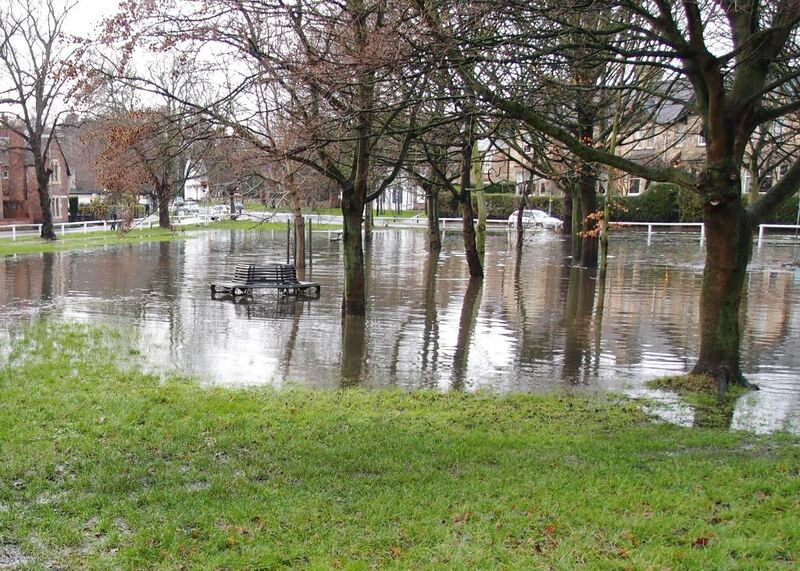 This is nowhere near the river, so clearly this isn’t the river bursting its banks kind of flooding. 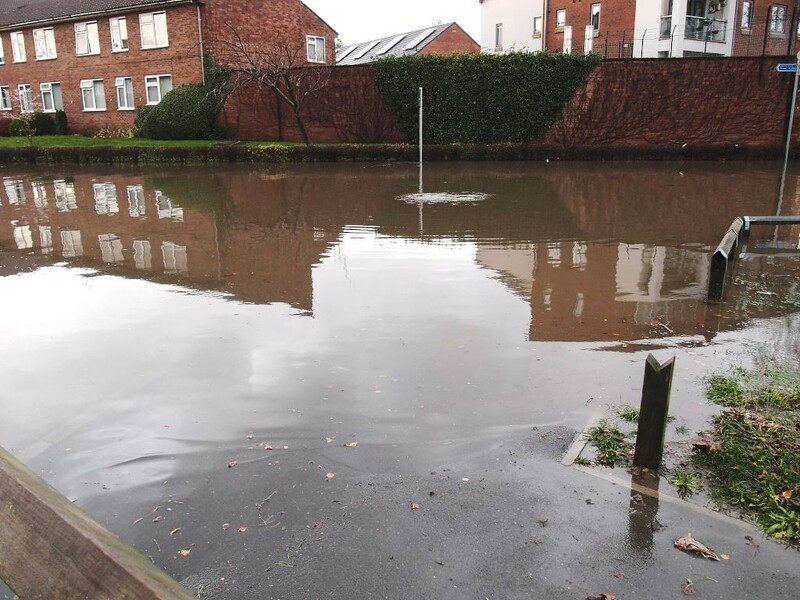 It might have been assumed that this was the result of heavy rain, and perhaps blocked/silted-up street drains (a fairly common problem in many suburban areas). After standing there a while it became clear that the water’s surface was in places bubbling up, presumably from manhole covers in the road. Suggesting that this water hadn’t come down from the sky but mainly up from the ground. This road is one of the old routes, and clearly has one of those typical old names, the ‘call it what it is’ type of name, like the many Church Lanes leading to churches. The map of 1852 shows the Burdyke (Bur Dike) running alongside Water Lane, which presumably often flooded back then. And on this day late in 2015 it was again. This isn’t uncommon, apparently. It was impassable near to the junction at Clifton Green by the time I got up there, but I wanted to see what was happening at the Green, so it was necessary to backtrack (and approach it via the forbiddingly named ‘Dead Man’s Alley’). 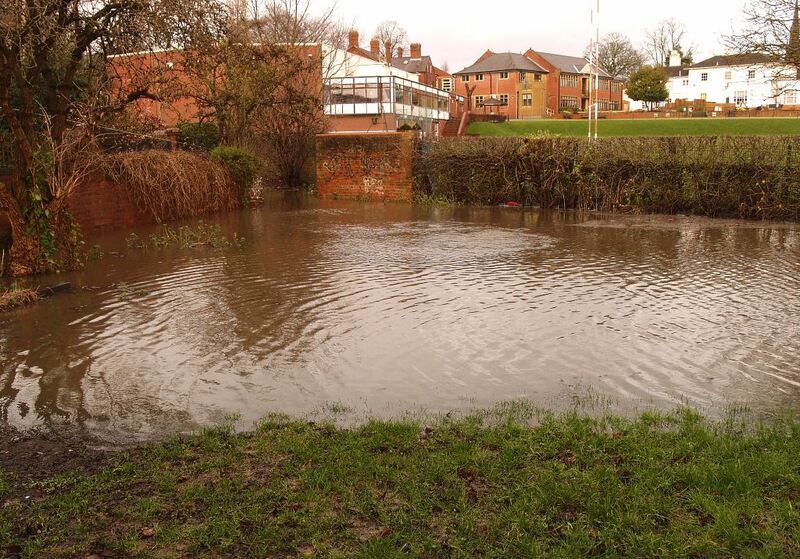 The water covered a large area of Clifton Green, and some of the road areas alongside. This used to happen a lot, and appears to have been much worse in the 1892 floods. The rest of this watercourse, heading downstream, is culverted (piped in). 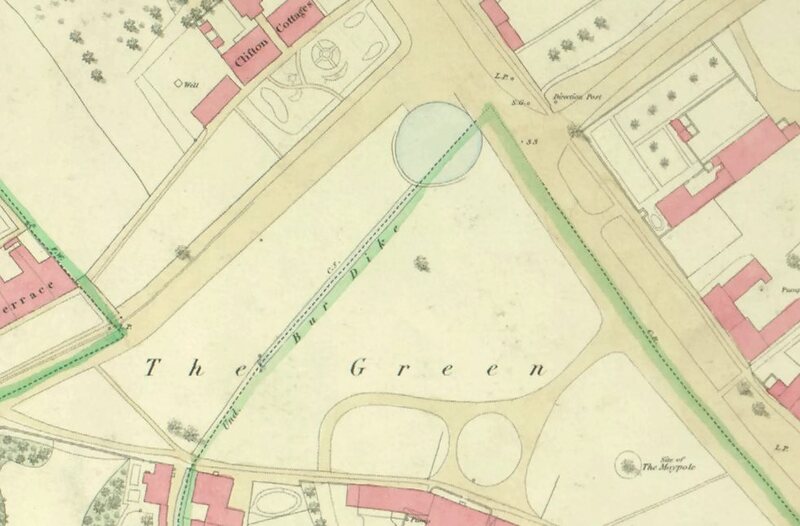 But apparently it still follows the same course as it used to, heading towards the Ouse via Water Lane and then Clifton Green, and then under a centuries-old pathway from the Green (which is still a snicket), bending its way behind back gardens and under roads. Near the end of Westminster Road it takes a turn towards the river. 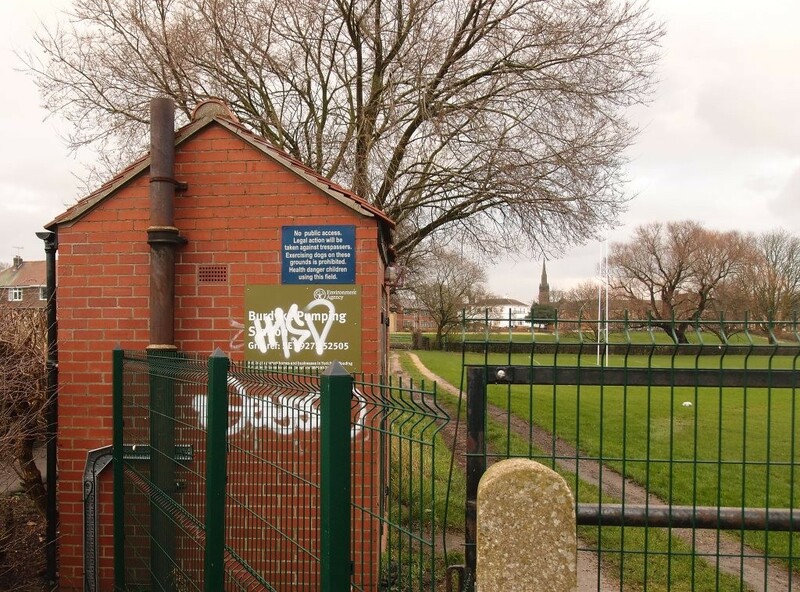 The flood alerts on Boxing Day had mentioned the Burdyke pumping station. I get the impression that the Burdyke pumping station isn’t a well-known structure. The pumps are apparently under the end of the floodbank behind St Peter’s, at the point where the path crosses from the river to the end of Westminster Road. At this point there’s a small brick shed behind the flood bank, and a concrete structure embedded into it. I’m sure I remember standing on the floodbank here during the floods of 2000 and hearing the noise from within, of the pumps, presumably, full-on and making quite a racket. Similarly in 2012, as mentioned on an earlier page. On Boxing Day this year, after seeing the water on Water Lane and Clifton Green I followed part of the route of the buried Burdyke, towards the river, thinking I’d stand on the floodbank and from there get a better view on things, a perspective on how bad it was, having stood/walked there so many times before. 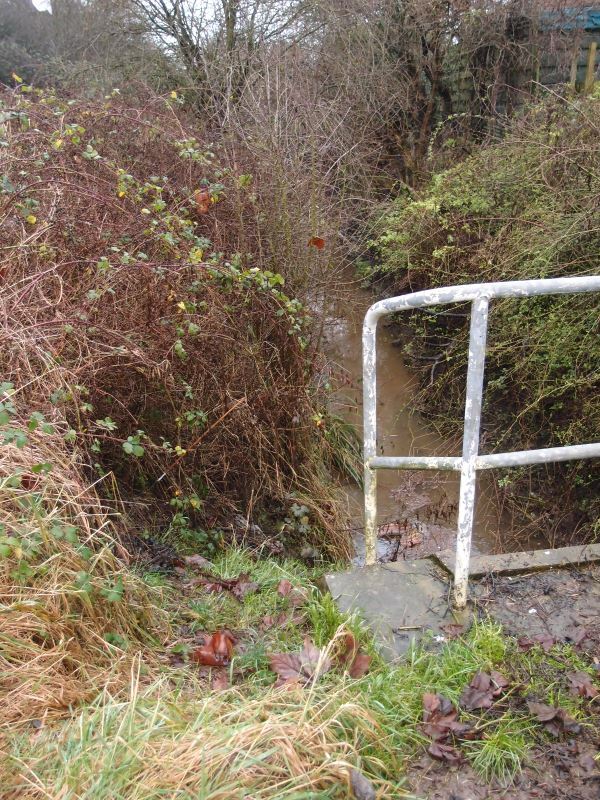 On the way, in this low-lying area on the old pathway/snicket by the school grounds, more evidence of what seemed to be the Burdyke bubbling up, near the end of Westminster Road. Then heading for the river, to survey the scene, the route became impassable in ordinary walking boots and would have needed wellies. I got as far as the brick building which is part of the pumping station for the Burdyke, but couldn’t get onto the floodbank beyond it. It all seemed fairly quiet down there, with a few people on the floodbank itself, standing looking at the water. I’d thought I’d be able to hear the pumps doing their thing, but perhaps, I thought, I wasn’t close enough. Later, reading comments on the Press website, I noticed a reader had mentioned that they thought those pumps at the Burdyke weren’t working. That they’d gone down to the riverside, (presumably via a different route or wearing wellies) and stood on the bank above the pumps, and thought that it all seemed rather quiet. 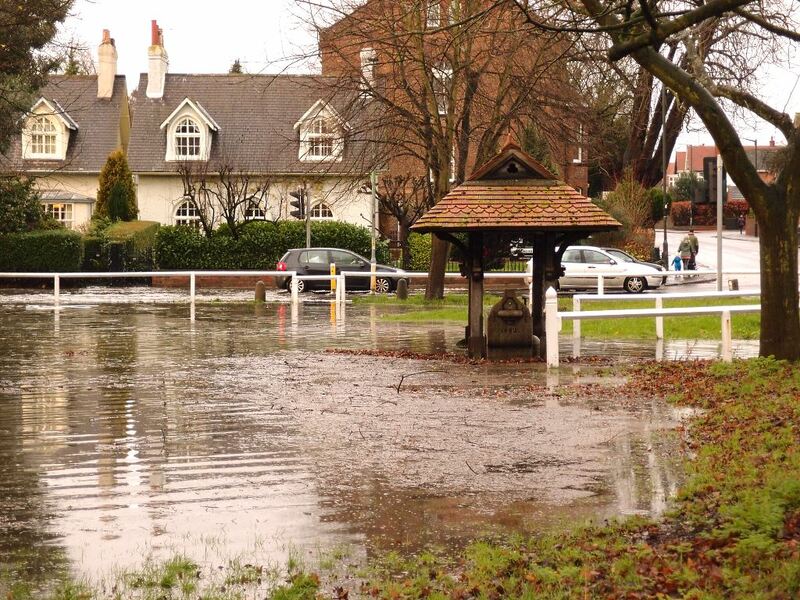 It could be that the Environment Agency have invested in extremely quiet pumps. Or that the person who commented on this online was mistaken. Or that the pumps had been turned off for some technical reason none of us understand. Or that they’d failed. 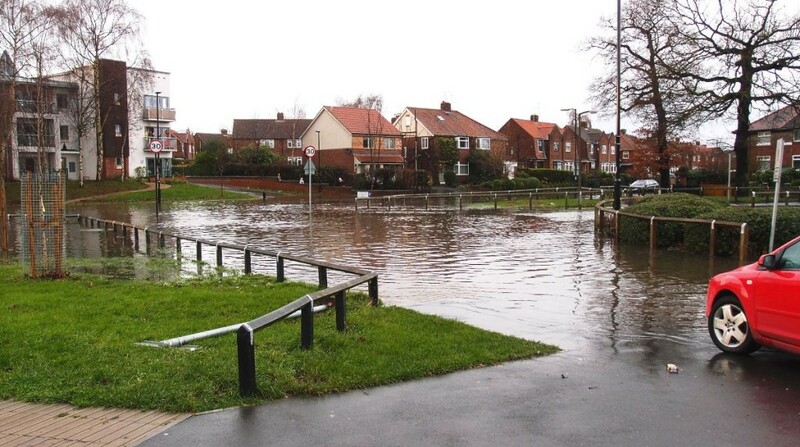 In any case, as far as I’m aware the flooding of the Burdyke area doesn’t cause any flooding of homes, it just seems to produce a temporary lake for Clifton and inconvenience motorists. Which is quite impressive really isn’t it. There was a bit of water left on the Green the day after (see the first photo on this page), but not much. I assume this was connected to the Burdyke and its pumps? Were the pumps ‘overwhelmed’ (a word I think I’ve seen in connection with the Foss barrier pumps) and then recovered themselves and resumed pumping, and that’s why all this water disappeared again surprisingly quickly? Did the emergency services come along in the night and manually pump the floodwater away? Does anyone know? I didn’t like to ask before now, as there have been more important things going on with the Foss at the other side of town. But it’s all linked, all these watercourses heading for the Ouse. I could go on, but I fear I’ve already overwhelmed readers with a flood of information. Thanks for reading. Comments and local insights (and expert insights from further afield) are welcome, as always. If any of the above is factually inaccurate, it’s not for want of trying. The information on the Burdyke and its pumping station is sparse and until recently it seemed fairly impossible to find any information on it at all. The playing fields alongside Bur Dike where it discharges into the Ouse were formerly Ings, i.e. winter-flooded hay meadows, as was much of the land along the river. The Bur Dike meadows were various known as Fettes Ings, Le Fetting, Futzing, Pettis Meadow or Little Ing: I guess this was a corruption of Norman French originally, these being the ‘little Ings’ in contrast to the ‘great Ings’ upstream. A perambulation of the City boundaries in 1455 mentions a bridge over a watercourse on the Little Ings, which presumably refers to a crossing of Bur Dike. These fields were still mapped as ‘Ings’ on early 19th century estate maps, so presumably flooded regularly. Interestingly, one of the fields at Clifton Backies alongside Bur Dike still has a flora typical of floodplain hay meadows, so streamside areas upstream of Water Lane may also have flooded historically. Bur Dike has such a small catchment that back-up of river water from the Ouse (rather than downstream flow) would have been the cause of flooding, hence the pumping station. Very interesting and helpful information Martin, thank you. ‘Fettes Ings, Le Fetting, Futzing, Pettis Meadow or Little Ing’ — wonderful old names! Another anecdote Lisa – the flood-prone Ings where Bur Dyke met the Ouse were used regularly for ice skating in the late Victorian period, which tells us something about the changing climate as well as the changing landscape. 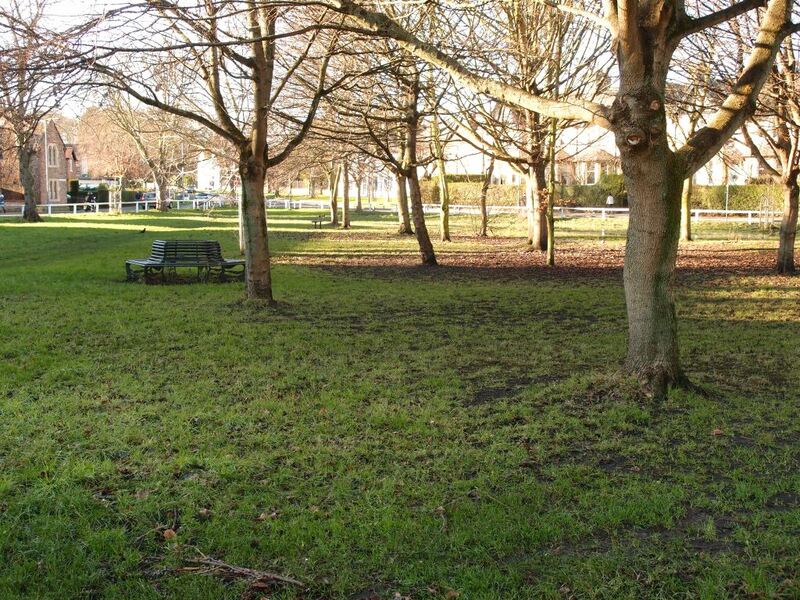 This area was known in winter as St Peter’s Lake and details of how to reach it were publicised in the skating summaries in the Leeds Mercury, Yorkshire Evening Post and other regional newspapers.